Yep that's right. It was very visible how each car handled the big bump on the inside of the right hander I was at on shakedown. Slightly off topic, but the Andretti Autosport team (who run the VW Beetles in the American Global Rallycross Championship) have been accused of fitting some sort of trick traction control system to the cars. Impressive engineering (but incredibly poor sportsmanship!) if that is the case. As for the WRC Polos, they do look incredibly planted, even when they are travelling sideways at speed. This is more of an opinion and wish than based on facts. It would be cool to see Audi in WRC again, not sure how that would work out with VW owning them. Some of the older 'members' stepping up to compete too would be nice. Again if only $$$ was never an issue. 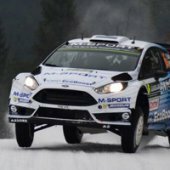 I haven't seen anything of Tanak's retirement from GB, so I just watched his onboard on WRC+ of stage 16, and he was incredibly unlucky. It just looks like he touched a bank, which 99 times out of 100 wouldn't have done anything. There were videos of Ogier and Mikkelson hitting banks in the Polo twice as hard as Tanak did. Do you know any site that have each rally with a 1 hour long recap posted anywhere? Got this one off ramPage! ...indicates that Citroen will sit out the 2016 WRC season and return again in 2017. Bad news for Meeke and Ostberg! Shame though we have to miss citroen for 2016... Or could there be a possibility that they will start as a privateer team next season? Bad news for Kris Meeke. After Mini it's the second time he is on a team that quits - or takes a hiatus. I really hope he finds a place at M-Sport or Hyundai. Or at least in a private Citroen. It's for the best for their future though, if they want to take the time to build a competitive car. Might be so that Meeke and Ostberg stay to test and develop the new car? Perhaps Meeke jumped ship before now, maybe he's been a catalyst in Citroen pulling 2016? Strong rumours that he's for Hyundai. By the way, what happened with Matthew Wilson? I remember him getting injured at some point but looking back at the season trough the link @Porkhammer posted you can see him doing recce work. Was it just funding stopping his WRC career or something else? Autosport are reporting that Ostberg won't be a part of Citroen's plans in 2016 and that they are still in talks with Meeke. The ideal solution would be for Citroen to allow Meeke to race for another marque in 2016, but I don't know how feasible that is (and it would surely be beneficial for Meeke to be involved with the development of the new car if he is to drive it in 2017). Short term the Citroen annoucement isn't great news as it seems even more likely that the 2016 season will be a VW whitewash. I personally think that's a price worth paying for seeing a decent 2017 season and beyond though: Citroen (hopefully) competitive again, VW, Ford, Hyundai and the return of Toyota. I suspect that the fact he wasn't that good and only had a seat because Daddy ran the company might be the reason. Or maybe they do what VW did before the Polo when they put Ogier and Abbring in a pair of Skoda's. I could see Citroen let Meeke run a R5 DS3 next year while the 2017 machine is being developed. Just find mattyjim1 on instagram and you will be automatically jelous about what he do, he tests thr fiesta and is the manager of Bentley MSport at GT3, BTW please Kris to MSport! We'll see. 2017 is going to be a very interesting year, that's for sure. 2016 not so much. Looks like a walkover for VW. Somehow I don't believe, Hyundai will be able to close the gap. And M-Sport just hasn't got the same resources. Hope I'm wrong though. Ostberg full season in a M-Sport Fiesta WRC. They need $ for developing new car that could compete with already developed VW for 2017.